Southern Caribbean- Diane's 40th Birthday Cruise! 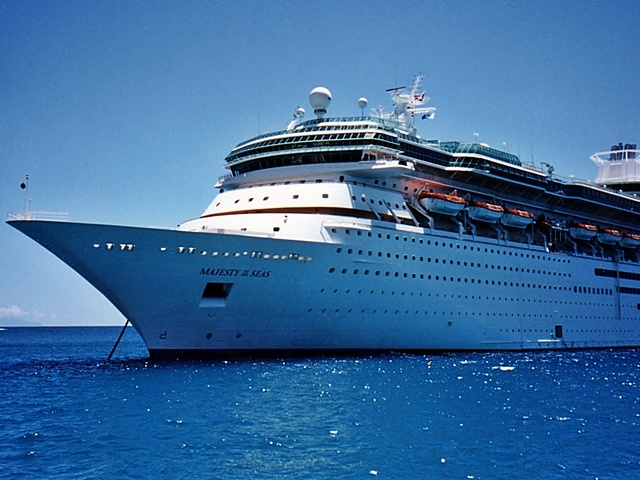 The Grand Old Dame, Majesty of the Seas! So, after years of hearing nothing but good things about Royal Caribbean, and deciding we were ready for a change of cruise lines so we jumped from our perennial favorite, Carnival, to Royal Caribbean... and we've never regretted it. In fact, we've become so addicted to RCCL (Royal Caribbean Cruise Lines aka Royal Caribbean International) ships that our main cruise page could be called, Paul & Diane's Royal Caribbean Cruise History. Royal Caribbean (RCCL) is the perfect fusion of everything we liked in both Carnival and Celebrity (this latter line merged with RCCL a while back, but they still operate semi independently)- great food, elegant ship and FUN! Our first experience with RCCL was onboard the Majesty of the Seas, a 74,000 ton ship, in March of 2000 to celebrate Diane's 40th birthday! We were joined by more then a dozen friends (our close friends, Chris and Pam, were unable to attend at the last minute, due to the unfortunate loss of Pam's father just a few days before the cruise. Happily we were able to cruise with them later in the year aboard the Grandeur of the Seas. 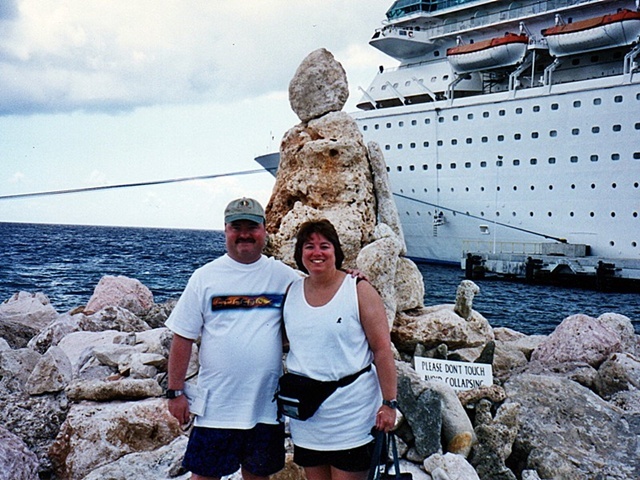 See the main menu for this cruise review) including Rob and Sue, Tony and Judi, and our family. In all our group for this cruise was 17 people! Wow! We all had outside and adjacent (more or less) category "F" cabins. All of our first time cruisers are now definite cruise fans! Below are pointers to pictures from this wonderful voyage. 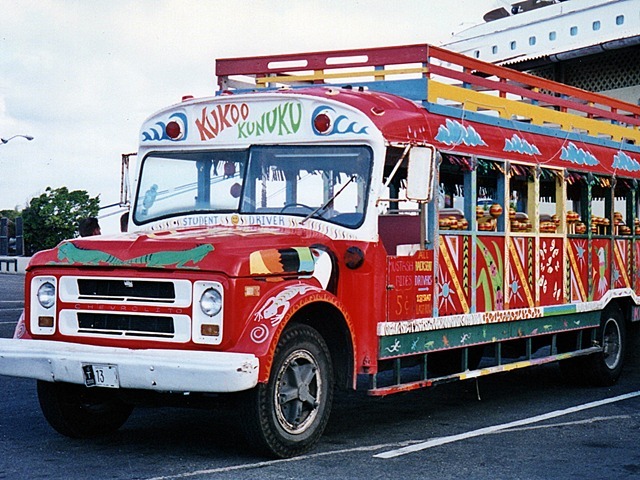 Our itinerary was the best by far of any- from San Juan to Aruba to Curacao to St. Martin to St. Thomas to San Juan. All of these islands were great and I'd do any one of them again in a minute! if they are still doing it, I highly recommend it! This was our first time to St. Martin (Patty and Mac's second home!) and we immediately decided that the beach there at Orient Bay is our favorite in the world bar none. Our original favorite, Magen's Bay is a distant second or third (behind Trunk Bay at St. John, but Magen's Bay is easier to get to while on a cruise). Update 2009- on our Mariner cruise in 2009, we decided that Trunk Bay is actually the most beautiful beach we've ever been to in the world... but Orient Bay comes in a strong second. We'd forgotten just how impossibly beautiful Trunk Bay is... any stop to St. Thomas should take advantage (where possible) of excursions to Trunk Bay in St. John. 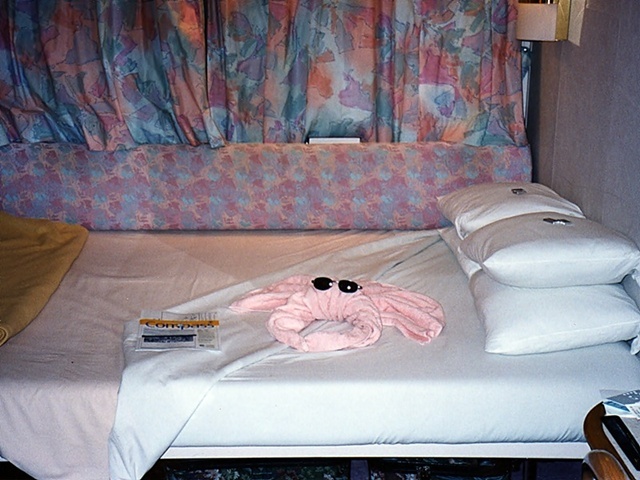 Consult your cruise ship's excursion desk. Note to first timers visiting Orient Bay: All of the beaches here are clothing optional and there is a nudist resort at one end of the bay's coast. (yellow umbrellas) Our favorite spot is La Playa Beach at Orient Bay. It's in the middle of everything. Say "Hi!" to Jerome! See the digital picture highlights of this cruise, press HERE!